Before Marie Kondo even touches a single item, she sits on the floor of the home with the owners and thanks the home. This may seem strange to some, but thanking someone is one way of acknowledging its purpose and saying goodbye. Since spring cleaning finances may require saying goodbye to some things, I thought this seemed fit. So your finances aren’t perfect. They may actually be downright messy. Regardless of the shambles of your financial state, it’s important to show gratitude for it anyway. After all, whether they were smart expenses or not, your money has opened you up to a world of opportunities and experiences. They’ve helped build your life, recognize value and even see things you wouldn’t have ordinarily seen. Even if you have no savings, drowning in debt, or living paycheck to paycheck your money helped create the life you live now. Part of letting go and organizing is coming to terms with what’s already brought you to this point. Consider it a form of closure – an important step to moving forward and decluttering anything. Or do like Melanie of the blog, Dear Debt and a write a letter to it that truly empowers you to move forward. Look at the pile of clothes that never got worn. Identify the expired coupons in the corner. This is all wasted money. Even dig up all those old tax returns and W2 forms and take a hard look at how much you’re actually making. The truth is, you have more than enough to move forward. You just need to acknowledge it, have faith in your capabilities and vow to get clean and make changes. Once you see your problems and identify where you may have taken a wrong turn, it will help move you in the right direction and get rid of your financial issues. And now for the part that everyone most associates with the Kon Mari method – identifying what sparks joy and getting rid of what doesn’t. Whether we like it or not, we are all emotional beings and every purchase we make can be linked to one. For example, paying for that Caribbean vacation may make you feel joy while that monthly gym payment just might make you frustrated. This should be obvious, but I don’t include those necessities like medication, electric bill, car maintenance and more. However, I do understand most people find little joy in paying those, so I’ll come back to it. For now lets focus on those necessities. Print out the last two to three months of your bank or credit card statements and carefully go through each item line by line. For every item that isn’t a necessity, rank the item for 1 to 10 in terms of how much joy that purchase has brought you. For any item, that doesn’t clearly bring you joy, consider slashing it from your budget. For example, you may have thought that going to the movies last month was a good idea, but in hindsight it wasn’t as joyful and as relaxing experience as you thought it would be. Meanwhile, that cup of coffee may actually bring you joy and solitude. We can also do the same thing for those bills and necessary evils like student loans. Again go through your bank statement and rank those bills that bring you the most frustration from 1 to 10. For any debt that ranks a 10 (most frustrating) make that the bill you choose to tackle for debt payoff first regardless of the interest rate, or what the debt snowball method says. Now this totally goes against the popular snowball method of debt payoff and the avalanche method. The snowball method refers to paying off debt by throwing all your extra money to the smallest debt first while working your way to the highest debt. Meanwhile, the avalanche method of debt payoff refers to tackling the debt with the highest interest rate first and working your way down to the smallest interest rate. Those are both great methods of debt payoff and amazing if either of them works for you. However, I’m realizing that as emotional beings, sometimes we are triggered and motivated by anger the most. So if we use the Marie Kondo method to identify the payments that most frustrate us, we may be able to use that anger as motivation to pay it off even faster. Who knew Marie Kondo could possibly hold the secret to getting out of debt too? 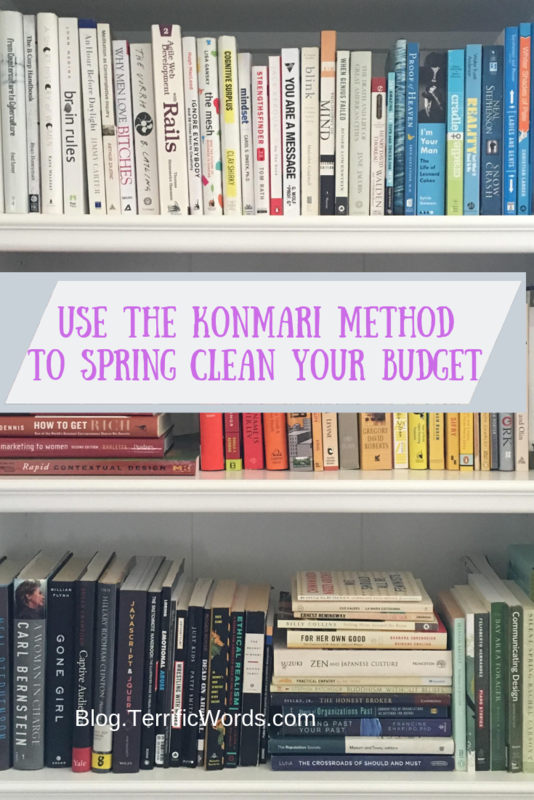 Once you’ve used the Kondo method to clean up your budget, it’s time to figure out exactly what to do to move forward and keep your finances just as organized. The trick is to spend with purpose. Before you purchase anything, consider your goals. Decide if it’s truly beneficial to you or if it’s really bringing joy into your life. Make sure it aligns with all the things you acknowledged as you combed through your bank statements and identified your trouble spots. If you do that before you buy anything, you’ll be on your way to healthy money habits and a much cleaner financial situation. Of course, the Kon Marie method isn’t the only way to organize your finances. There are many other ways to organize and things that should be in order to truly get control of your finances. Honestly, I’m no expert on any of them. So instead, I’ll point you in the direction of these fabulous bloggers with great tips on getting your finances in order. How do you spring clean your finances? Are you a fan of Marie Kondo and her organization methods? TERRIfic Quip – Money is a tool that will work for us, not against us if we allow it. I love the idea of applying Marie Kondo’s technique to cleaning up my finances. There are definitely items in my CC statements that are a source of frustration and need to go away! Yes! Once you go through your statement you’ll be surprised what purchases trigger certain emotions. Makes it so much easier to get back on track.